The oldest railway station in Paris is being updated to handle newer, larger trains. 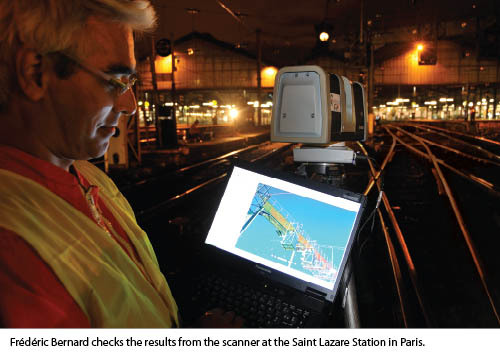 A French company is using 3D scanning technology to keep the work on track. It’s not the first time that the train station at Saint-Lazare in Paris has been remodeled. Opened in 1837 and immortalized in a series of Claude Monet paintings, the Gare Saint-Lazare (Saint Lazare Station) was Paris’s first railway station. Since its beginning with a single track, Gare Saint-Lazare has expanded over the years to become the second-busiest station in France and third-busiest in Europe. Operating mainly as a suburban station, the facility’s 27 platforms handle more than 100 million passengers every year and provide access to local, regional and intercity rail travel. Now Gare Saint-Lazare is experiencing another change. As part of a modernization effort by Société Nationale des Chemins de fer Français (SNCF), France’s national state-owned railway company, Saint-Lazare’s familiar stainless steel trains will soon disappear. They will be replaced with new equipment, which SNCF plans to introduce across the Ile de France network between now and 2016. The new rolling stock is larger and longer than the equipment currently in use, and Saint-Lazare is undergoing a remodeling to handle the new cars and locomotives. To accommodate the larger trains, SNCF must modify all the equipment installed at the ends of the Gare Saint-Lazare platforms. Additionally, SNCF must relocate the station’s signaling gantry, an overhead steel structure that straddles the station’s 16 tracks. The gantry holds the signal lamps, signs, and other devices that inform train operators about speed limits and when their trains should enter or leave the station. The start and stop points also will be moved several meters to accommodate the length of the new trains. The Urbica field team for the project included surveyor Romuald Clavé and three 3D scanning technicians. Each technician was equipped with a Trimble FX 3D Scanner and laptop computer. Clavé used a Trimble S8 Total Station, an automated, robotic total station that can operate on its own while controlled remotely by a single person. Using Trimble MultiTrack™ technology, the Trimble S8 automatically tracked Clavé as he moved around the station carrying a prism target and pole. Clavé controlled the instrument via radio link from the Trimble CU Controller mounted on the prism pole. By using the instrument’s automatic pointing system, Clavé could control the accuracy of the total station’s measurements and record them directly into the CU memory. To use the total station, Clavé set it on points with known coordinates and then oriented it to other known points. Next, he measured a series of target points that would serve as reference control points for the scanners and total station. For the scanners, the team placed special targets on the surveyed points; the scanners could identify these targets and use them as orientation and reference points. 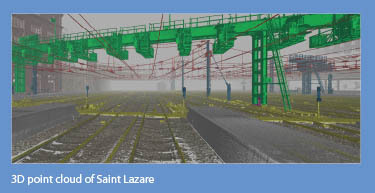 At each setup, the scanners measured to several control targets and made the computations to orient themselves into the Saint-Lazare coordinate frame. With the orientation computations complete, all field measurements could be made directly in the national coordinate system used by SNCF. This approach made it simple to superimpose the new measurements onto existing drawings of the station. In addition to providing control for the scanners, the total station collected information on station installations. This provided additional checks on the data and helped ensure tight correlation between the new measurements and existing SNCF data. The team used one of the Trimble FX Scanners to conduct short-range scans of the gantry. The other two scanners collected scans around the rails on a portion of platform approximately 6 m (20 ft) long. These scans extended approximately 60 m (200 ft) down the tracks. When measuring far down the tracks, the angle of incidence for the scanners’ laser beams became quite small. The highly experienced Urbica team understood that the shallow angles and poor lighting conditions might affect the precision of measurements to the tracks. To make the difficult measurements, the technicians used the 2-pass measurement configuration of their Trimble FX Scanners. The 2-pass approach—which combines readings taken using different wavelengths to accurately determine the distance to each point—ensured that the measurements met the required precision. Busy train traffic and safety concerns forced the team to work on the midnight-to-morning schedule. In two nights’ work at the station, Clavé and his team completed about 10 hours of scanning. They occupied 50 different instrument points and collected roughly 300 million individual 3D points. Using the scanners, they measured objects ranging from 12 m (39 ft) to more than 90 m (295 ft) away. To provide a uniform point cloud, the team configured the scanners to collect points on a 5-mm (0.02-ft) grid. The project specifications called for each point to have a precision of 20 mm (0.06 ft) in horizontal and vertical components. According to Eeckman, the actual results were even better; most points had a deviation of roughly 10 mm (0.03 ft). The team noted an interesting benefit from using the Trimble S8 for project control. 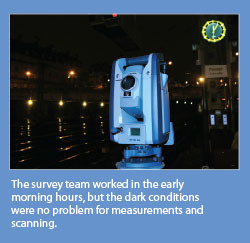 Working at night with a conventional total station, the surveyors would have needed artificial light sources to help the operator see and point to the prism targets. Instead, by using the Trimble S8 automatic pointing, the team could work in dark conditions and still obtain the accurate positions needed by the scanners. Eeckman said that a key part of the project success came from the ability to integrate data from the three scanners and the total station. “It saved a surveyor from spending several additional nights on site,” he said. 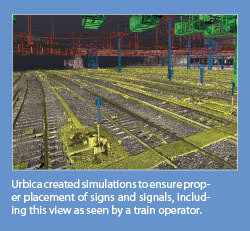 Urbica used Trimble RealWorks to create simulations of the planned changes. “We made calculations by combining measured data with the dimensions of the future rolling stock,” Clavé said. “We were able to simulate the view of the lighting and signaling that each crewman will see from the operator’s cab onboard the new trains. We used a video camera to simulate a crewman’s head movements when reading the signals displayed on the gantry.” The simulation helped to assess whether a train operator would be correctly positioned to view the signals and checked that the catenaries would not obstruct his or her vision. Eeckman said that SNCF was pleased with the results and will incorporate the 3D information into reports for its infrastructure management teams. The client reported that the ability to gather detailed information and use it to create simulations is a big step; the SNCF design, planning, and construction processes will benefit from the rapid data collection and the accurate models that it produces. Carl Morton is a writer specializing in the geomatics, civil engineering, and construction industries. Drawing on his extensive training and experience, Morton focuses on applications and innovations in equipment, software, and techniques.